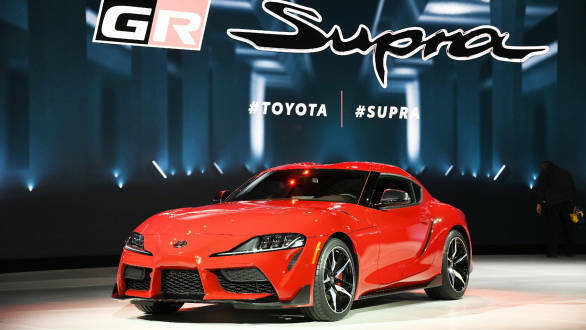 Months of drip-fed information on the new Toyota Supra finally conclude with its world debut at the North American International Auto Show (NAIAS) at Detroit. The fifth-gen A90 Supra looks to take off where its predecessor left off over two decades back  with a straight six-cylinder driving the rear wheels. 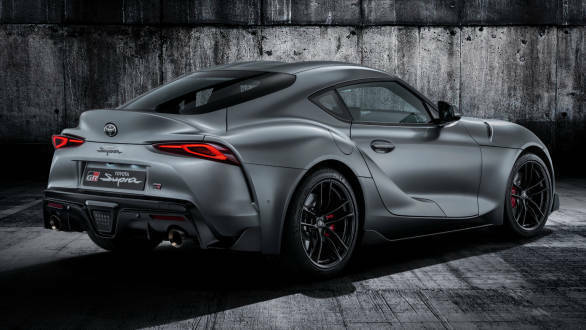 This one has been jointly developed by Toyota Gazoo Racing and BMW, and the only difference between the new Supra and BMW's Z4 is that the former is available only as a coupe, while the latter can only be had as a roadster. Also different is the styling, Toyota's own, which was previewed on the FT-1 concept car from NAIAS 2014. 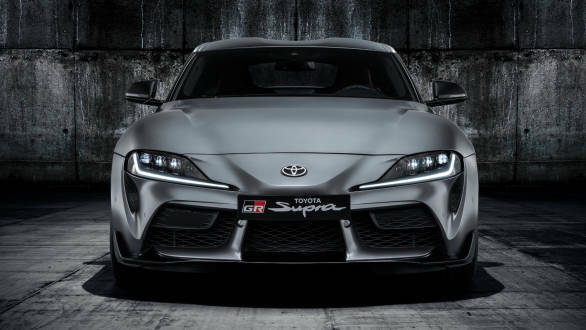 So while the classic front-engined, rear-wheel drive layout remains the same as on the previous gen, the new Supra appears more compact thanks to more purposeful lines. It is a short wheelbase car, and in stretching out the hood and placing the driver nearly over the rear axle, has achieved perfect 50:50 front-to-rear weight distribution. It's still a small car, in fact shorter than Toyota's own GT86, a 2+2 sportscar that will sit below the 2-seater Supra in the lineup. 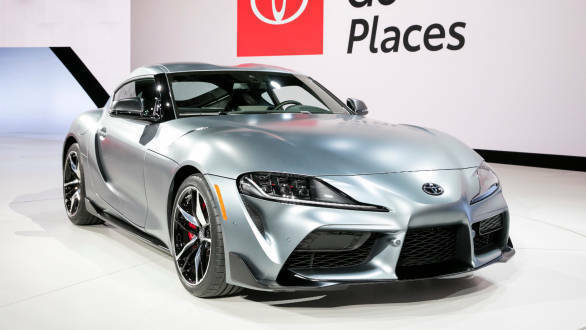 There's plenty of nods to Toyota's sportscar heritage in the styling, with the double bubble roof harking back to the Toyota 2000GT, while the integrated boot spoiler is a reference to the original Supra. Under the long hood is the same engine as in the BMW Z4 M40i, a 3-litre twin-scroll turbocharged six-cylinder producing 340PS and 500Nm of torque. 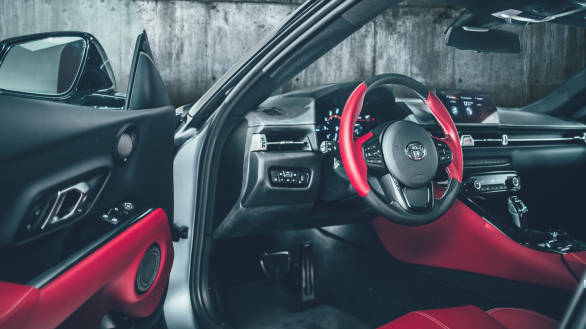 Unfortunately, the Supra will only be offered with an eight-speed automatic. But that does enable a quick 4.1 seconds from standstill to 100kmph, comparable to the more powerful BMW Z4. 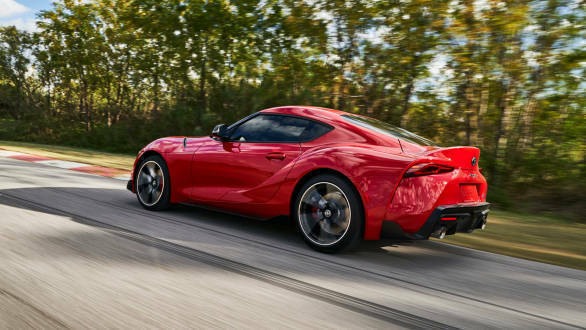 The Supra also gets an active differential on the rear driven axle, and can split torque between 0-100 per cent between each side, under both acceleration and braking. Furthering handling is the low centre of gravity, and a chassis that's been tuned at the Nürburgring. A front spring/strut and rear multi-link suspension combination has been employed, with optimisations made in rigidity of mountings (like the front sub-frame), and in use of light-weight aluminium parts (like the control arms) to control unsprung mass. Curb weight stands at 1,540kg, which gives the Toyota Supra a rough-20kg advantage over the Z4. The suspension is adaptive, and controlled by the two driving modes. The Supra will wear staggered rubber, with 255-section tyres at the front and 275-section tyres at the rear, on 19-inch wheels as standard. It resembles the new Z4 more greatly on the inside, with the exception of dials taking the place of the digital screen for driver information.